Hello! This week at Just Us Girls, Bobby has the Photo Inspiration challenge. She chose this fresh and summery photo. Here's a closeup so you can see more details. When I saw those cookies with the swirly frosting on them, I immediately thought of the Circle Scribbles stamp set from PTI. So I stamped them on watercolor paper and embossed them with white embossing powder. I then watercolored them with distress inks in colors I took from the inspiration photo. 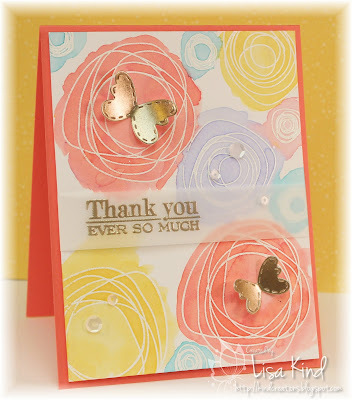 The sentiment and butterflies were embossed with Liquid Platinum embossing powder, even thought they look gold. I added sequins for additional interest. 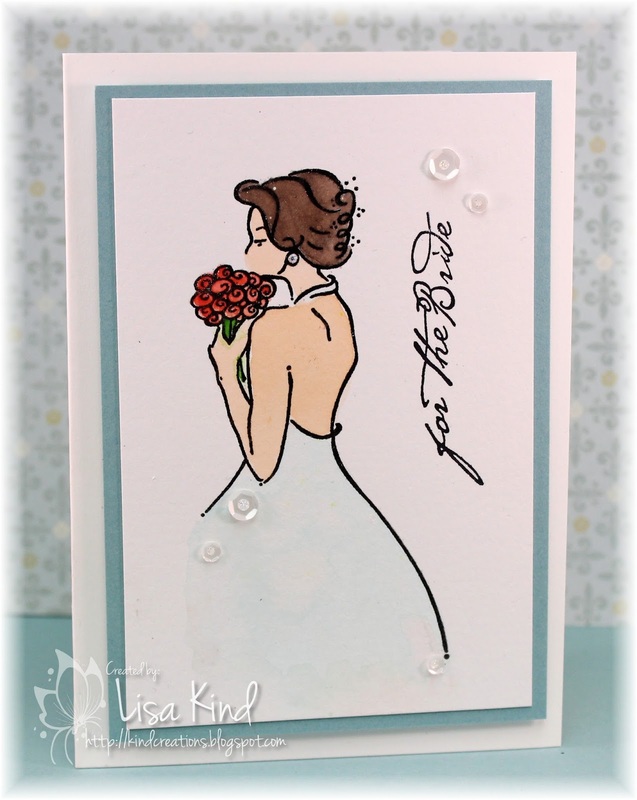 I usually use white card stock as my base, but today I used a coral card stock instead. The main panel is on craft foam. I should also mention that this card is a CASE of Danielle Flanders' card. I looked up this stamp set on PTI and saw her card. It was just what I was looking for as inspiration on how to use this set (for the first time!). Hi friends! 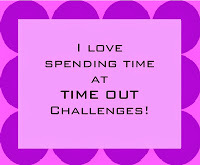 The challenge over at the Time Out blog this time around is a theme challenge. The theme is CELEBRATIONS. 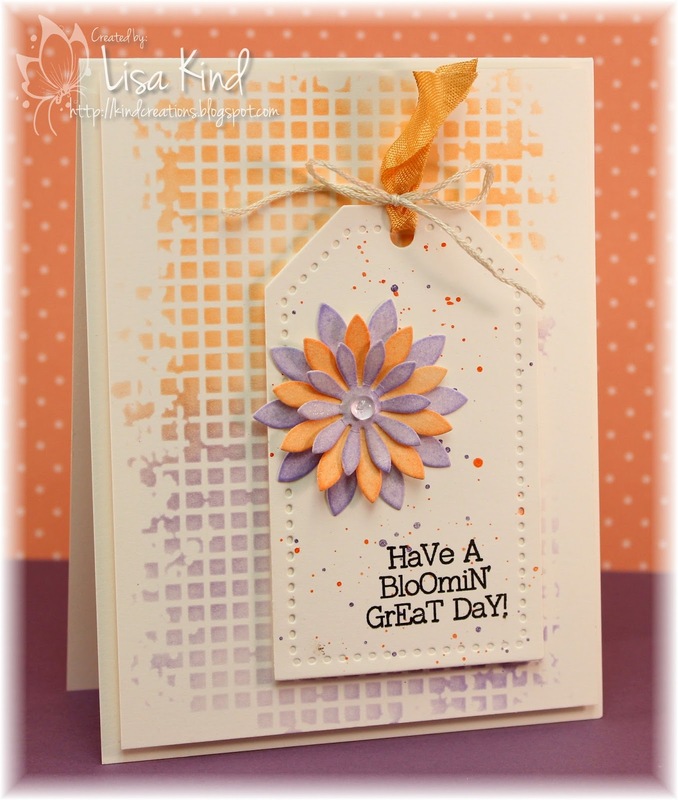 You can also twist this challenge by die cutting or fussy cutting. 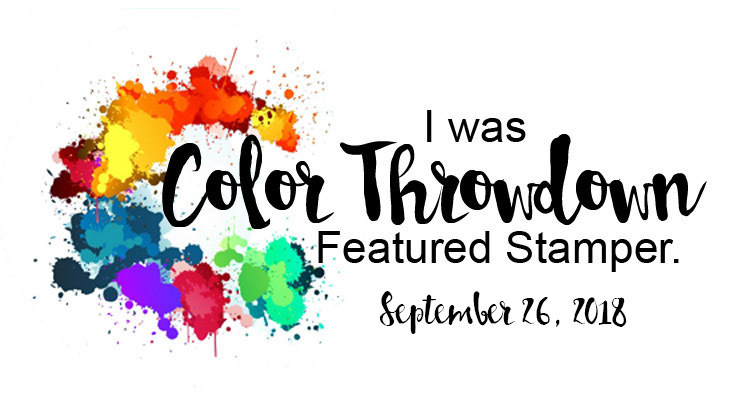 Our guest for this challenge is Elizabeth Stewart. 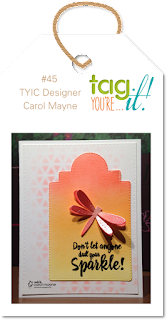 You can see her card and our DT cards on the Time Out blog. This challenge is sponsored by CAS-ual Fridays. 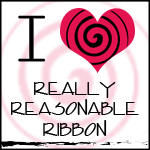 They are giving a $25 gift voucher randomly to someone who twists with this challenge! Hi friends! 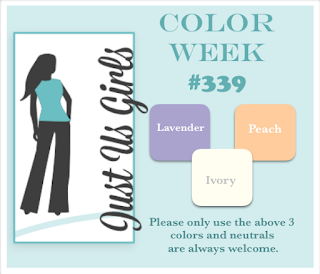 It's color week over at Just Us Girls and Judy has chosen these beautifully soft colors. 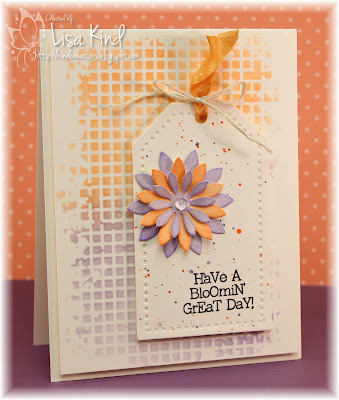 I used the peach and lavender colors through a stencil on ivory cardstock. Then I used them again on the flower. The tag was splattered with these colors as well. I added some peach seam binding tied with ivory floss. The main panel and the tag are popped up on craft foam. 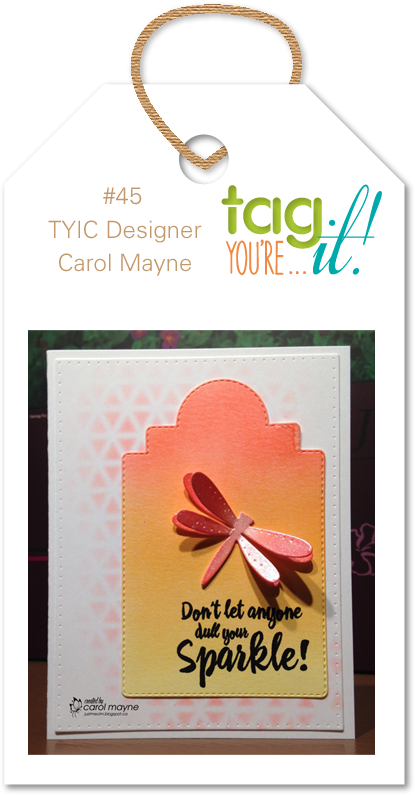 I'm playing along with the current Tag You're It challenge. 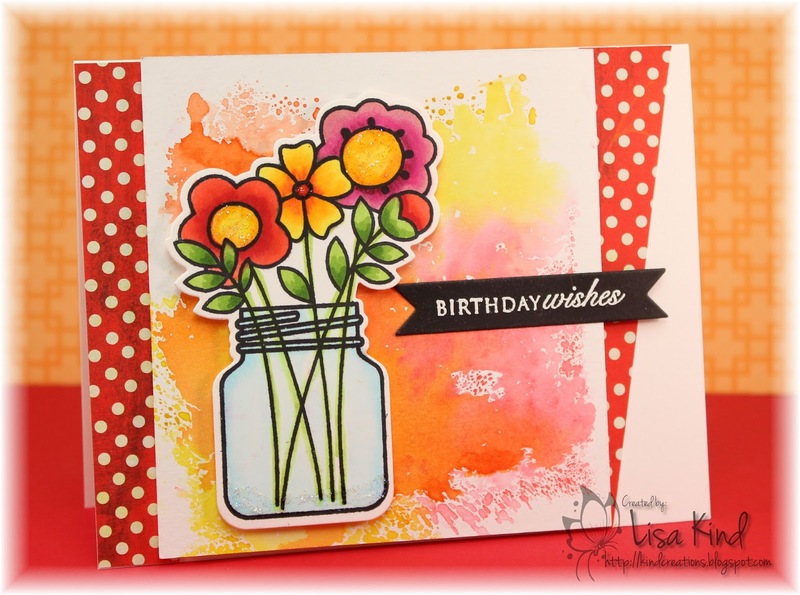 You can see more from the JUGs design team and our April guest Angie on the JUGs blog. Hi everyone! Have you tried the "smooshing" technique yet? It's quite popular and very easy to do. 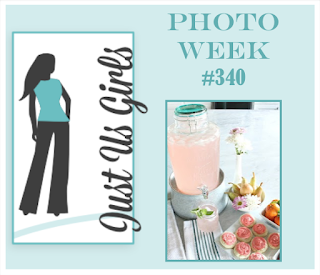 That's the challenge for Trend Week over at Just Us Girls. To get this effect, I smooshed three distress inks on my craft mat, spritzed it with water, and laid my watercolor paper in it. I dried it with my heat tool and was done. 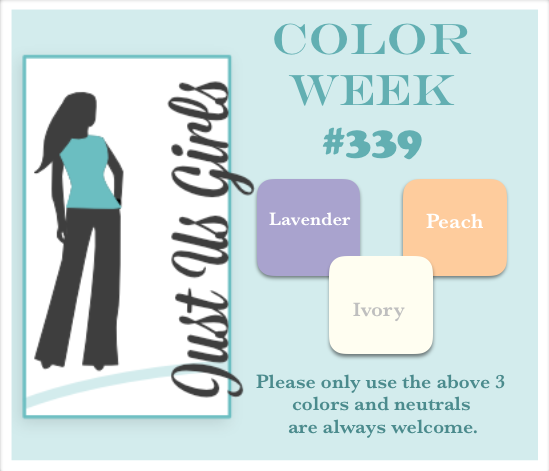 You just have to be certain not to place colors next to each other that will mix into a muddy color. To finish off my panel, I added a die cut that I stamped and colored with copic markers. 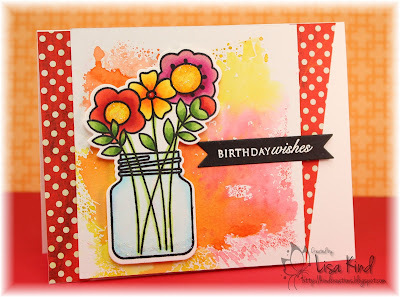 I added star dust stickles to the flower centers and a little bit on the bottom of the jar. The cool layout is from this week's Freshly Made Sketches. 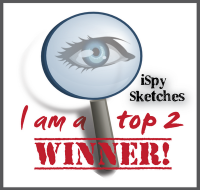 I just had to use this sketch when I saw it! 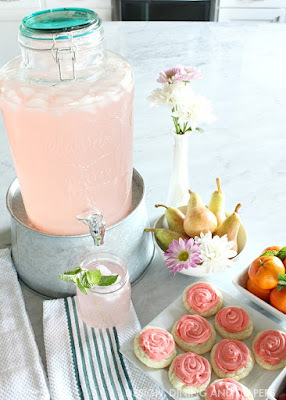 You can see more from the JUGs design team and our guest Angie Cimbalo on the JUGs blog. It's Thursday and that much closer to the weekend! I'm going to see Diana Ross in concert on Saturday so that should be fun. I saw her years ago and it was a good concert. Looking forward to it! I'm also looking forward to this week's Time Out challenge. It's our Home Sweet Home challenge where we give you a photo and you use it as inspiration. Here's the photo for your inspiration. 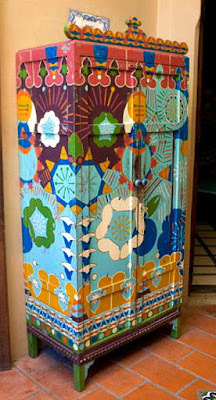 Isn't this piece of furniture so cool and colorful? I immediately thought of Basic Grey's Marrakech paper pack because it has so many of these colors in it. Once I chose the pattern paper from the pack, I had to figure out how I was going to use it. I chose this quilt die and die cut the pattern paper and cream paper with it. I punched out all the pieces from both papers and inlaid all the pattern paper pieces into the cream frame. This card is going to a good male friend of ours who treated myself, another female friend, and his date to a concert and appetizers and drinks last week. He had extra tickets and wouldn't take money for them, so the least I could do was send a card. I die cut the thanks die three times and stacked them. Since it's going to a guy, I decided not to add any sequins like I usually do (it was difficult not to, believe me!). 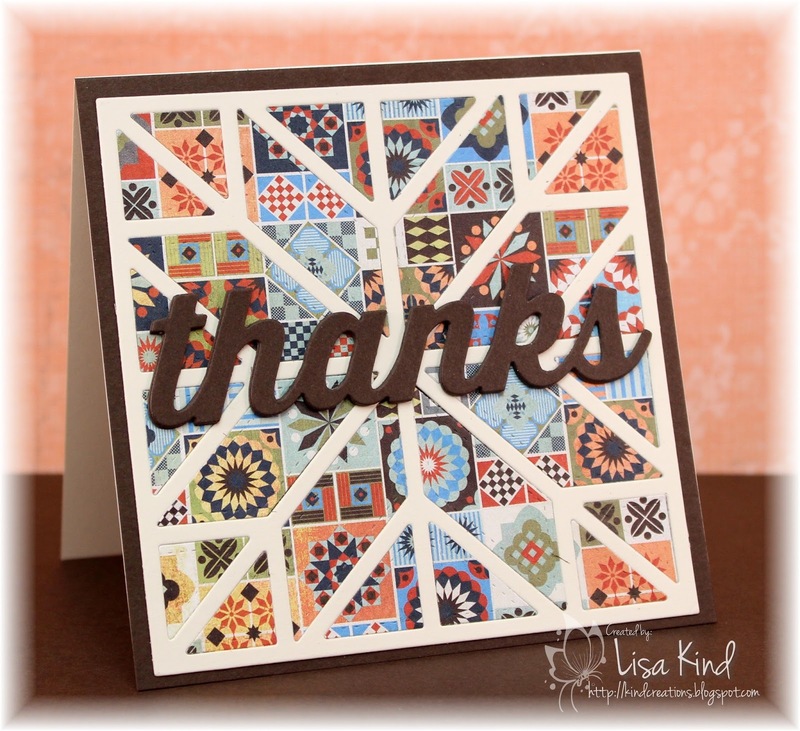 I matted the quilt piece on the same brown cardstock I used for the sentiment. This card is a 4.25 x 4.25 square card. This challenge is sponsored by Happy Little Stampers. They are offering a $15 gift voucher to the winner. Kylie, the owner, is joining us as our special guest designer. We also have Elisabeth joining us as a guest designer. You can see more inspiration from the team on the Time Out blog.